Margaret Atwood was born in 1939 in Ottawa and grew up in northern Ontario, Quebec, and Toronto. She received her undergraduate degree from Victoria College at the University of Toronto and her master's degree from Radcliffe College. Throughout her writing career, Margaret Atwood has received numerous awards and honourary degrees. She is the author of more than thirty-five volumes of poetry, children's literature, fiction, and non-fiction and is perhaps best known for her novels, which include The Edible Woman (1970) , The Handmaid's Tale (1983) , The Robber Bride (1994) , Alias Grace (1996) , and The Blind Assassin, which won the prestigious Booker Prize in 2000. Atwood's dystopic novel, Oryx and Crake, was published in 2003. The Tent (mini-fictions) and Moral Disorder (short stories) both appeared in 2006. Her most recent volume of poetry, The Door, was published in 2007. Her non-fiction book, Payback: Debt and the Shadow Side of Wealth ­ in the Massey series, appeared in 2008, and her most recent novel, The Year of the Flood, in the autumn of 2009. Ms. Atwood's work has been published in more than forty languages, including Farsi, Japanese, Turkish, Finnish, Korean, Icelandic and Estonian. In 2004 she co-invented the Long Pen TM. Margaret Atwood currently lives in Toronto with writer Graeme Gibson. Associations: Margaret Atwood was President of the Writers' Union of Canada from May 1981 to May 1982, and was President of International P.E.N., Canadian Centre (English Speaking) from 1984-1986. She and Graeme Gibson are the Joint Honourary Presidents of the Rare Bird Society within BirdLife International. 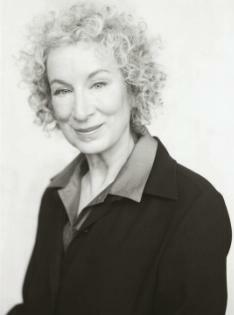 Ms. Atwood is also a current Vice-President of PEN International.